A60JAZZ is a brand-new, independent Japanese jazz label extablished by Kenny Inaoka, a veteral producer known for his long association with the ECM label. The "A60" part of the name means "around 60," in the same vain as certain age groups of soccor players are described as "U21" (under 21), etc. Inaoka is essentially targeting his own age group, adults with experience and taste to distinguish the fluff and the real stuff. 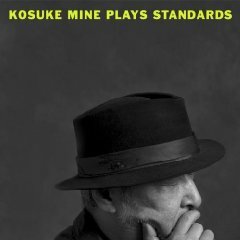 For the first three releases, he also focused on veteran Japanese musicians who are also "around 60" years of age: super trumpeter Tiger Okoshi, trombonist Shigeharu Mukai and tenor saxophonist Kosuke Mine. Employing a well-known recording engineer with a purist approach, the label strives to present high quality performances with high quality sound. The first three releases are all suberb, both in terms of music and sound quality. They demonstrate that a Japanese label can produce world-class CDs by recording top Japanese musicians in Tokyo.